Language: Somali is the official language. English and Arabic are also widely spoken. Religion: Islam (official religion) and it is forbidden to propagate other religions. Individuals are however free to practice their own religions. The Government of Somaliland has been a member of UNPO since 2004. The Republic of Somaliland is a sovereign, democratic State in the Horn of Africa, sharing its borders with Djibouti to the West, Ethiopia to the South, Somalia to the East and the Gulf of Aden to the North. Somaliland has a coastline of 850,800 km. It encompasses the territory of the former British Protectorate of Somaliland whose borders were established by international treaties between 1888 and 1897. Somaliland achieved its full independence from the United Kingdom on 26 June 1960, becoming the 15th African Country to do so. 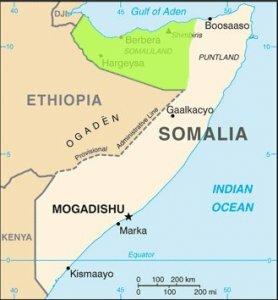 It voluntarily entered a union with Somalia in July 1960. However, following a civil war and the collapse of Somalia, it withdrew from the union and reclaimed its independence on 18 May 1991. Since declaring its independence in 1991, Somaliland has overcome a legacy of conflict and civil war to secure peace and stability within its borders. It is a thriving and durable democratic society with a multi-party system. It holds regular elections and has witnessed multiple peaceful transfers of power. Its bicameral Parliament successfully blends traditional and modern forms of authority and representation. Its citizens have taken part in five rounds of peaceful and internationally-observed multi-party elections at the presidential, parliamentary and local levels. International monitors have witnessed all of Somaliland’s elections since 2003 and pronounced them free and fair. The aim of unifying Somali factions continues today as the 2000 Arta Conference in Djibouti created a Transnational National government (TNG), claiming to represent Somalia and Somaliland as one entity. Having been lobbying for sovereign recognition, Somaliland opted not to participate in the negotiations. Since 1991, Somaliland has lobbied the international community to accept the de facto independence it has enjoyed for the last 25 years. The governments of Somaliland and Somalia initiated a dialogue in 2012 with a view to clarifying their future relationship, but the talks collapsed in 2015 because Somalia failed to implement what had been agreed and showed an absence of good faith. Attempts to resurrect the talks, in the last one being in 2016, have so far proved fruitless, although Somaliland being ready to reengage should Somalia show by its gestures and behavior that it is prepared to take the process seriously. Somaliland continues to assert its sovereignty and independence to the international community, including through the UNPO. Somaliland argues that it is not looking for recognition, but rather ‘re-recognition’ since it was granted independence as a British protectorate in 1960, five days before it agreed to merge with Somalia. Somaliland wants the international community to re-recognise its decision to end the voluntary union with Somalia, in line with other African precedents and accordingly with the African Union (AU)’s principle of “respect[ing] the borders existing on (…) achievement of independence” (Charter of the Organization of African Unity (OAU), Resolution AHG/Res.16(I), July 1964). The AU Commission sent a fact-finding mission to Hargeisa in 2005 to investigate the case for Somaliland becoming a member, and therefore being recognised as a State. The delegation then recommended that Somaliland be treated as a special case. But in 2007, the AU accepted the argument put forward by the Transitional Federal Government of Somalia that the time was not ripe. The AU has not looked at the matter since. Whilst Somaliland remains a ‘State-in-waiting’, it nevertheless continues to satisfy all the criteria for statehood in customary international law. It possesses a permanent population, a defined territory, a government and the capacity to enter into relations with other States. In 2016, over a million Somalilanders signed a petition supporting the country’s recognition (Somaliland Sun, 23 August 2016; VOA news, 24 August 2016). Eventhough Somaliland is doing much better on human rights issues than its neighbor in the Horn of Africa, it stays nonetheless a very conservative place. Female genital mutilation (FGM) is a common practice in Somaliland where it is estimated that around 98% of women have to go through it. It is all natural that women activism plays an extremely important role regarding this issue, not only in order to improve the quality of life of millions of women, but also to show the world that Somaliland is a place of progress and that they are trying to move forward in terms of women rights. Ubah Ali is one of those Somaliland women activists who devote her life to the end of FGM and the improvement of women rights in her country. Please download our Somaliland Member Brochure.